VMware vCenter Server is a critical component in a vSphere environment, because is needed to provide some cluster functionality. A good design and deployment (that are different from version 5.x and 6.0) are important to avoid possible issues. And, of couse, a good availability of this kind of service. Troubleshoot this component is not always simple and there are a lot of VMware KB articles, but not a good single resource from where start in this kind of tasks. The purpose of this book is really clear from the title itself (vCenter troubleshooting) and the authors are valuable guys from the IT world with great skill (including a VCDX). But does it really match and reach the objectives in less than 200 pages? 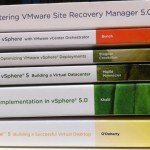 The book does not spend time and pages in describing at high level the vCenter architecture itself (in my opinion should be useful to understand how the different components works together and simply the troubleshooting if some parts does not work properly) and goes directly to the technical and procedural aspects. Some details are provided directly in each chapter. Chapter 1 is dedicated to the vCenter Upgrades and Migrations aspects and it’s well done, considering that include some of the best practices and requirements analysis. Really good the part about databases migration, but limited the part about migration between the installable and the appliance versions (more options and consideration where possible). Chapter 3 is SSO oriented considering that cover the access, permission and authorization aspects. Chapter 4 is dedicated at the monitoring and how tune vCenter for it. Chapter 5 covers how work with storage, starting from the VM snapshots, file locks, datastore managements and how use vCOPS (not updated to vRealize) to improve monitoring. VASA, VAAI, … are missing. Finally chapter 6 start consider how solve some Not-so-common vCenter issues and this part is really valuable, but too short! Chapter 7 goes back to the management aspects considering the backup and restore aspects. But chapter 8 return to the troubleshooting aspects with additional support methods and tools. And chapter 9 starts with a general troubleshooting method and how to apply to vCenter. Then, unfortunately the book is finished. Pro: it’s not only related to vCenter Server 5.x, but include also some (in my opinion too few) notes on vCenter 6.0. Pro: it covers also the vCSA, but without give idea on how choose this instead of the installable version, or how this choice can impact the troubleshooting aspects. So, does it really match and reach the objectives? From my point of view only in part with a good chapter 6 and some ideas in chapter 9, but with very few pages. But the idea is good and there is the needs of a book that covers this topics. Update the book to the vCenter 6.0, add more details on the vCenter components, reorganized it better (a deployment part is missing, but is really important to avoid possible problems), update also vCOPS to vRealize (and include some other tools from Flings or 3rd part software house), can be a way to go to make the second edition a bestsellers in the IT books.